How many ways can you substring a string? Part 1, I had said that there can be other ways of doing it, and that some enhancements were possible. This post (Part 2) is about that. Find and yield all substrings of s of length 1. Find and yield all substrings of s of length 2. Find and yield all substrings of s of length n.
Even without doing any formal analysis of the algorithm, we can intuitively see that it is correct, because it accounts for all possible cases (except for the empty string, but adding that is trivial). The code for this new algorithm is in program all_substrings2.py below. Function and program to find all substrings of a given string. of a given string s.
2. if len_s == 0, return ""
BTW, I added the empty string as the last item in the message_lines list (in the usage() function), as a small trick, to avoid having to explicitly add an extra newline after the joined string in the write() call. Print all substrings of a_string. Error: Exactly one argument must be given. The count of substrings for each succeeding run (which has one more character in the input string than the preceding run has), is equal to the sum of the count for the preceding run and the length of the input string for the succeeding run; e.g. 10 + 5 = 15, 15 + 6 = 21, 21 + 7 = 28, etc. This is the same as the sum of the first n natural numbers. There is a well-known formula for that sum: n * (n + 1) / 2. From this we can see that the sum of this sequence satisfies the formula n * (n + 1) / 2, where n = 100, i.e. 100 * (100 + 1) / 2 = 50 * 101. – the list approach has to create and store all the substrings first, before it can return them. So it uses memory proportional to the sum of the sizes of all the substrings generated, with some overhead due to Python’s dynamic nature (but that per-string overhead exists for the generator approach too). (See this post: Exploring sizes of data types in Python.) The list approach will need a bit of overhead for the list too. But the generator approach needs to handle only one substring at a time, before yielding it to the caller, and does not use a list. So it will potentially use much less memory, particularly for larger input strings. The generator approach may even be faster than the list version, since repeated memory (re)allocation for the list (as it expands) has some overhead. But that is speculation on my part as of now. To be sure of it, one would have to do some analysis and/or some speed measurements of relevant test programs. 1) By doing it internal to the program, using a Python dict. All we have to do is add each substring (as a key, with the corresponding value being anything, say None), to a dict, as and when the substring is generated. Then the substrings in the dict are guaranteed to be unique. Then at the end, we just print the substrings from the dict instead of from the list. If we want to print the substrings in the same order they were generated, we can use an OrderedDict. That’s it for now. I have a few more points which I may want to add; if I decide to do so, I’ll do them in a Part 3 post. 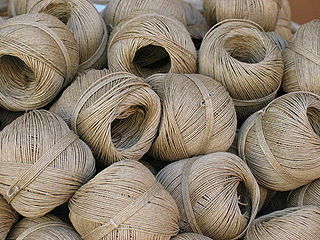 The image at the top of the post is of spools of twine (a kind of string) from Wikipedia. I conduct online courses on Python programming, Unix/Linux (commands and shell scripting) and SQL programming and database design, with personal coaching sessions. DPD: Digital Publishing for Ebooks and Downloads. Hit the ground running with my vi quickstart tutorial. I wrote it at the request of two Windows system administrator friends who were given additional charge of some Unix systems. They later told me that it helped them to quickly start using vi to edit text files on Unix. Track Conversions and Monitor Click Fraud with Improvely.